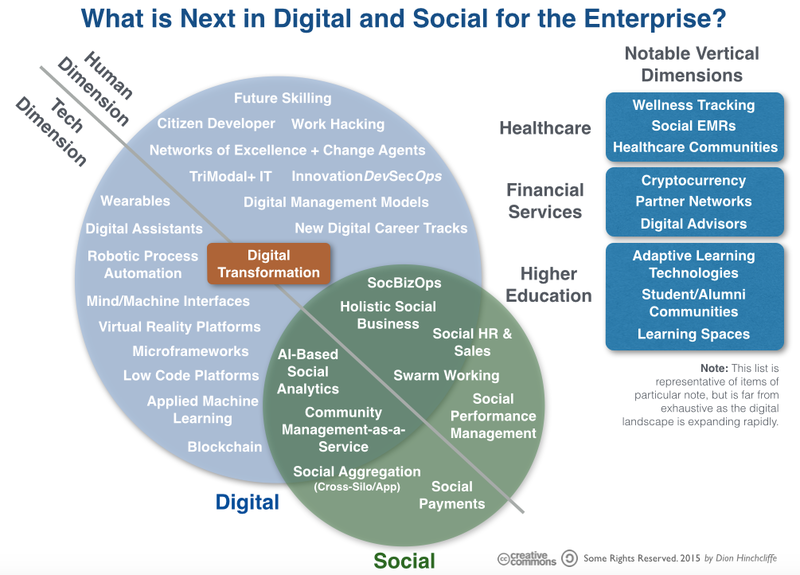 What’s Coming Next in Digital and Social in the Enterprise? I’ve been taking a close look at what’s over the enterprise horizon for much of the year as the pace of technology change continues to accelerate, as most experts have long predicted and which will only continue. New platforms, technologies, product, services, and models are appearing at a constant pace these days. Many topics that are hot today were barely on anyone’s radar a short while ago, from the blockchain and holacracy, to social performance management and trimodal IT, to name four of a great many important topics that have been significant recently. The result is, if you’re not currently dedicating a significant amount of time in some part of your organization researching what’s happening, the digital world is almost certainly leaving you behind. In fact, as I’ve been making the point recently, our traditional methods for adapting to and absorbing new technology are breaking down in the face of the torrent of digital innovation our organizations are currently experiencing. In short, we need new models and effective strategies for technology adaptation, and the good news is that some workable approaches are now emerging, discovered and proven in recent years new through bold experiments by IT and business leaders in the field. Even though culture and practices are likely to be the biggest obstacle, as Isaac Sackolick recently observed, we still need new processes that span IT and business that can greatly accelerate our ability to adapt to the marketplace. But, as we’re sorting out how we should strategically manage our technology portfolios today, we still need to keep a close eye on the stream of what’s happening in digital and social, making sure key developments are on our evaluation and adoption plans as appropriate. To that end, I’ll be taking my latest survey of high impact new digital technologies likely to offer significant advantage to the enterprise in the very near future for my upcoming session at Dreamforce 2015 next week in San Francisco. One thing is sure however: Digital transformation must take place hand-in hand with human transformation. So I’ve broken the list down into those two swimlanes, as we have to both change our technology landscape and ourselves into order to more successfully adapt. I’ve also included three verticals that I believe are experiencing particular disruption/renewal due to recent digital advances. Note: I’ve included links to some of these advances above, but will explore them individually in more detail on ZDNet soon. I also believe there are some major developments in healthcare (wellness tracking, social electronic medical records, healthcare communities), financial services (cryptocurrency, partner networks, digital advisors), and higher education (adaptive learning communities, student/alumni communities, and new digital learning spaces) that represent major opportunities for the majority of organizations in these sectors. To get a deeper exploration of each of these topics, please attend my Dreamforce 2015 session, titled “Vital Trends in Digital/Social Impacting Your Business in 2015 & Beyond” at the Hilton Union Square, Continental Parlor 5 on Tuesday, September 15th at 2:30PM PT. Update: My deck for this session has now been posted on Slideshare. One Response to What’s Coming Next in Digital and Social in the Enterprise?